Ozane Termite and Pest Control’s Mosquito Control Program features monthly treatments of your lawn, shrubs, and other areas mosquitoes inhabit with our new Mist Blowing Machine giving the best mosquito control in NJ. The Mist Blowing Machine emits small enough particles to reach all treatment surfaces without it drifting off target. 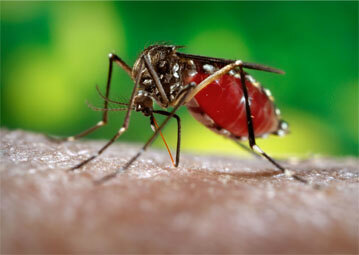 The pesticide emitted from the machine will kill mosquitoes for up to 30 days after application. For the best results, we recommend monthly treatments from May through September. » Get rid of old tires, tin cans, buckets, drums, bottles or any water-holding containers. » Keep roof and gutters free of leaves and other debris. » Keep grass cut and shrubbery well trimmed around the house so adult mosquitoes will not hide there. » Sign up for Ozane Termite and Pest Control’s Mosquito Program and begin suppressing mosquito populations on your property.